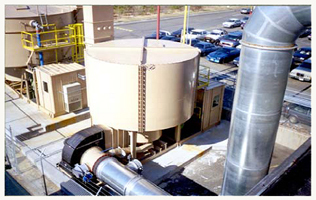 The Simplest Thermal Oxidizer is a direct fired thermal oxidizer, or after- burner, that employs no heat recovery. adding an air-to-air heat exchanger creates a recuperative thermal oxidizer that provides energy efficiency through heat recovery. adding a bed of catalyst to athermal oxidizer provides increased energy efficiency. a catalys is a substance that promotes oxidation without being consumed. Recuperative thermal oxidizers can be applied to almost all combustible organic pollutants in a vapor state. The oxidizers are applied in virtually any industry, but can often be found in chemical, pharmaceutical, printing, coating, paper, textile and paint finishing applications. Recuperative oxidizer units are most economical when excess thermal energy can be recovered for use elsewhere in the production processes. Recuperative oxidizer operating costs are lower when the incoming solvent concentration is high, so less burner fuel is required. VOC catalyst can be added to the combustion chamber of almost any oxidizer to promote VOC destruction at lower operating temperatures (typically 600°F to 900°F), lowering fuel usage. Note: Catalytic oxidizers are only suitable for processes whose constituents will not adversely affect the life of the catalyst. An Regenerative Thermal Oxidizer - RTO is an oxidizer that works more efficiently, using less energy than a Recuperative. Heating the polluted air stream to an oxidizing temperature requires considerable thermal energy. The RTO’s unique heat recovery system is designed to redirect the majority of this energy for reuse in treating the incoming process air stream. This design reduces fuel consumption to a fraction of what would be required with conventional oxidizers. The regenerative heat recovery process uses multiple masses (beds) of heat-resistant ceramic material to store and release thermal energy. The ceramic material is designed to provide free airflow and maximize internal surface area, promoting high heat transfer. The beds are housed in insulated towers and connect to an insulated combustion chamber. A valve mechanism is used to direct the VOC laden air into the beds, then direct the oxidized clean air to the RTO’s exhaust stack. • Can be a regenerative catalytic oxidizer (RCO) by adding catalyst. An odd tower rto incorporates a purge feature, allowing higher destruction efficiencies (dre). By eliminating the odd tower and purge, capital cost saving are relized at the expense of dre. A Rotaryvalve RTO Represents the state of the art in rto technology. the single rotating valve provides > 99% dre in a compact robust package.